The Global Volcanism Program has no activity reports for Peter I Island. The Global Volcanism Program has no Weekly Reports available for Peter I Island. The Global Volcanism Program has no Bulletin Reports available for Peter I Island. The Global Volcanism Program has no synonyms or subfeatures listed for Peter I Island. The 11 x 19 km Peter I Island in the Bellingshausen Sea opposite Ellsworth Land is a morphologically youthful shield-like volcano. A 100-m-wide circular crater is found at its summit. The island was discovered by the Russian explorer Bellingshausen in 1821; extensive summer pack ice and its isolated location far from regular shipping lanes have restricted visits. Dated samples range from 0.35 to 0.1 million years old (Prestvik et al. 1990). The unmodified volcanic form of the upper part of the edifice suggests that parts of it may be Holocene or even historical in age (LeMasurier and Thomson 1990). Prestvik T, Barnes C G, Sundvoll B, Duncan R A, 1990. Petrology of Peter I Oy (Peter I Island), west Antarctica. J. Volcanol. Geotherm. Res., 44: 315-338. The Global Volcanism Program is not aware of any Holocene eruptions from Peter I Island. If this volcano has had large eruptions (VEI >= 4) prior to 10,000 years ago, information might be found on the Peter I Island page in the LaMEVE (Large Magnitude Explosive Volcanic Eruptions) database, a part of the Volcano Global Risk Identification and Analysis Project (VOGRIPA). There is no Deformation History data available for Peter I Island. There is no Emissions History data available for Peter I Island. 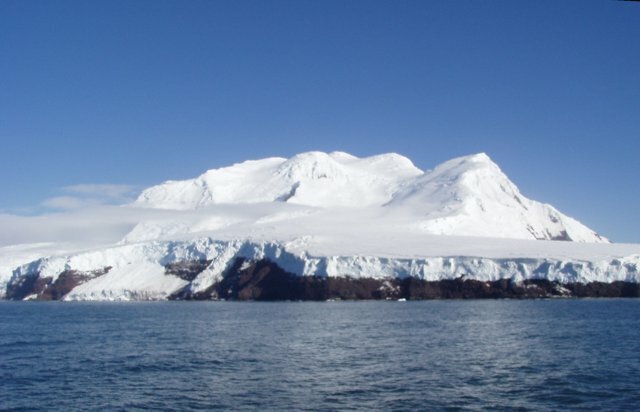 Peter I Island, located in the Bellingshausen Sea opposite Ellsworth Land, is seen here from the north showing Lars Christiansen Peak. The morphologically youthful shield-like volcano has an abrupt coastline and is more dissected on the northern side, with a broad, gentle slope to the south. The island was discovered by the Russian explorer Bellingshausen in 1821, and extensive summer pack ice and its isolated location far from regular shipping lanes have restricted visits to the island. Photo by Melvin Vye, 2006. The Global Volcanism Program has no maps available for Peter I Island. There are no samples for Peter I Island in the Smithsonian's NMNH Department of Mineral Sciences Rock and Ore collection. Large Eruptions of Peter I Island Information about large Quaternary eruptions (VEI >= 4) is cataloged in the Large Magnitude Explosive Volcanic Eruptions (LaMEVE) database of the Volcano Global Risk Identification and Analysis Project (VOGRIPA).